The Blackwood Falls apartments in Gloucester Township Sunday, where a man was killed and a woman and 10-year-old child were severely burned in an early morning fire. Authorities in Gloucester Township are investigating the cause of an apartment fire that killed a man early Sunday morning and severely burned a woman and a 10-year-old child. 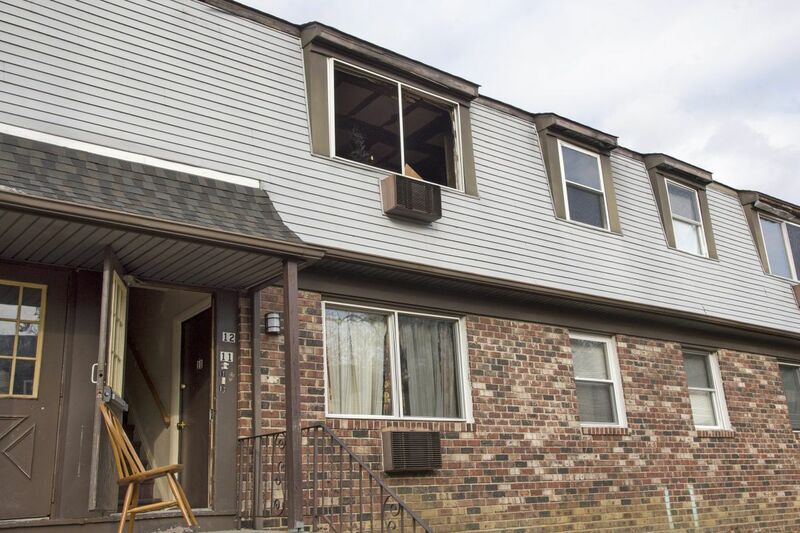 The Gloucester Township Police Department said the woman and child were being treated for the injuries they received in the blaze at the Blackwood Falls Apartment complex in the 200 block of Washington Avenue. Police said the victims' names were being withheld until relatives have been notified. Police who arrived at the scene shortly after 2:54 a.m. found heavy smoke coming from the victims' apartment in Building D of the complex. Officers and responders from the Blackwood Fire Department entered the smoke-filled apartment and carried out the two adults and the child. The man, who was said to be in his 30s, was pronounced dead at the scene. A woman in her 30s was taken by ambulance to Cooper University Hospital, where she was in critical condition with burns and smoke inhalation. A 10-year-old girl was flown to Saint Christopher's Hospital for Children, where she is in critical condition with burns, WPVI reported. No update on their conditions was available. "Unfortunately there were three injuries with one confirmed fatality," Harry Earle, chief of Gloucester Township Police, told KYW. Residents from several adjacent apartments were evacuated safely. In all, 18 people from eight apartments were temporarily displaced. "Fortunately, [there was] not much extensive damage to other apartments," Earle said. Firefighters from several stations responded. Earle said the fire was under control in about 30 minutes. There were no reported injuries to any other Blackwood Falls residents or to emergency personnel. The New Jersey Division of Fire Safety and the Gloucester Township Investigations Bureau are trying to determine the cause of the fire. Staff writer Martha Woodall contributed to this report.